Portland, Maine, was one of several New England cities to shatter records for high temperatures Wednesday. It got warmer than 64 degrees, breaking the previous record of 55 degrees set in 2012 - and it could impact business in one of the state's most important industries. “It's summer come early,” said Jordan Yanni, while golfing in shorts at the Nonesuch Golf Course in Scarborough. "Conditions are good, considering we just had snow the other day." Golf courses have been benefiting from the mild winter – Nonesuch was able to stay open until mid-December, then opened again this March – but some scientists warn it could disrupt one of Maine’s most important industries. According to the Gulf of Maine Research Institute, the ocean temperature is running three degrees above normal right now. 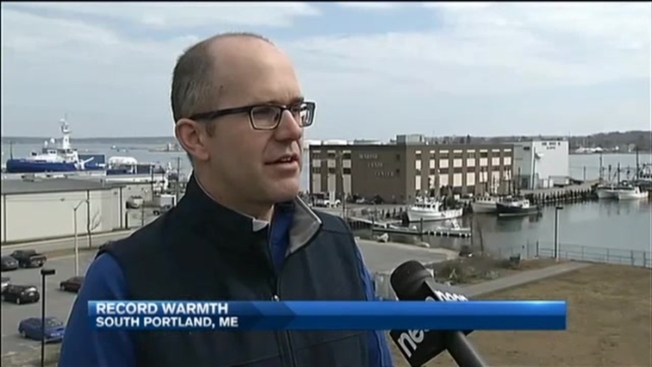 Chief Scientific Officer Andrew Pershing uses water temperature data to predict how Maine lobster will be impacted. The annual Lobster Forecast predicts lobsters will "switch into the high intensity summer period" about two to three weeks earlier than usual this year. "We're putting this out there in hopes that the supply chain can be ready to take in this catch," Pershing said. Lobster prices depend on a variety of factors, but if an early season ends up creating a larger lobster population, that could drive down prices this summer. Pershing said the warmer ocean temperatures could also mean mid-Atlantic species move into the Gulf of Maine, such as squid and sea bass. "We expect to see a lot of changes," he said.